Forget executive privilege, contempt of Congress, "fast and furious," how many documents the government has produced and who said what to whom on which date. The Obama administration has almost certainly engaged in the most shockingly vile corruption scandal in the history of the country, not counting the results of Season Eight on "American Idol." Administration officials intentionally put guns into the hands of Mexican drug cartels, so that when the guns taken from Mexican crime scenes turned out to be American guns, Democrats would have a reason to crack down on gun sellers in the United States. Democrats will never stop trying to take our guns away. They see something more lethal than a salad shooter and wet themselves. But since their party was thrown out of Congress for the first time in nearly half a century as a result of passing the 1994 "assault weapons ban," even liberals know they're going to need a really good argument to pass any limitation on guns ever again. So it's curious that Democrats all started telling the same lie about guns as soon as Obama became president. In March 2009, Secretary of State Hillary Clinton announced to reporters on a trip to Mexico: "Since we know that the vast majority, 90 percent of that weaponry (used by Mexican drug cartels), comes from our country, we are going to try to stop it from getting there in the first place." As she sentimentally elaborated on Fox News' Greta Van Susteren show: "The guns sold in the United States, which are illegal in Mexico, get smuggled and shipped across our border and arm these terrible drug-dealing criminals so that they can outgun these poor police officers along the border and elsewhere in Mexico." Suddenly that 90 percent statistic was everywhere. It was like the statistic on women beaten by their husbands on Super Bowl Sunday. CBS' Bob Schieffer asked Obama on "Face the Nation": "It's my understanding that 90 percent of the guns that they're getting down in Mexico are coming from the United States. We don't seem to be doing a very good job of cutting off the gun flow. Do you need any kind of legislative help on that front? Have you, for example, thought about asking Congress to reinstate the ban on assault weapons?" At a Senate hearing, Sen. Dianne Feinstein, D-Calif., said: "It is unacceptable to have 90 percent of the guns that are picked up in Mexico and used to shoot judges, police officers and mayors ... come from the United States." And then, thanks to Fox News -- the first network to report it -- we found out the 90 percent figure was complete bunkum. It was a fabrication told by William Hoover, of the Bureau of Alcohol, Tobacco, Firearms and Explosives (BATF), and then spread like wildfire by Democrats and the media. Mexican law enforcement authorities send only a fraction of the guns they recover from criminals back to the U.S. for tracing. Which guns do they send? 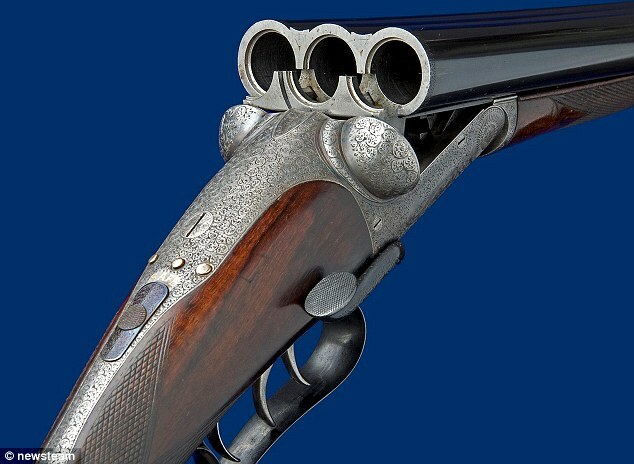 The guns that have U.S. serial numbers on them. It would be like asking a library to produce all their Mark Twain books and then concluding that 90 percent of the books in that library are by Mark Twain. You begin to see why the left hates Fox News so much. Obama backed away from the preposterous 90 percent claim. His National Security Council spokesman explained to Fox News that by "recovered," they meant "guns traceable to the United States." So, in other words, Democrats were frantically citing the amazing fact that almost all the guns traceable to the U.S. were ... traceable to the U.S.
Attorney General Eric Holder told reporters that even if the percentage is inaccurate, the "vast majority" of guns seized in crimes in Mexico come from the United States. And he should know, because it turns out he was sending them there! Apart from the guns Holder was giving them, this was an absurd claim. Most of the guns used by drug cartels are automatic weapons -- not to mention shoulder-fired rockets -- that can't be sold to most Americans. They are acquired from places like Russia, China and Guatemala. Right about the time the 90 percent lie was unraveling, the Obama administration decided to directly hand thousands of American guns over to Mexican criminals. Apart from the fact that tracking thousands of guns into Mexico is not feasible or rational, the dumped guns didn't have GPS tracing devices on them, anyway. There is no conceivable law enforcement objective to such a program. (3) After they were busted on their lie, the Obama administration began dumping thousands of guns in the hands of Mexican criminals. We also know that hundreds of people were murdered with these U.S.-government-supplied guns, including at least one American, U.S. Border Patrol agent Brian Terry. But let's look on the bright side. The BATF was originally going to ship warheads to Iran until realizing the explosions might disable the tracking devices. No one has explained what putting 2,500 untraceable guns in the hands of Mexican drug dealers was supposed to accomplish. But you know what that might have accomplished? It would make the Democrats' lie retroactively true -- allowing them to push for the same gun restrictions they were planning when they first concocted it. A majority of guns recovered from Mexican criminals would, at last, be American guns, because Eric Holder had put them there. Unfortunately for the Democrats, some brave whistleblower inside the government leaked details of this monstrous scheme. As soon as Congress and the public demanded answers, Holder clammed up. He just says "oops" -- and accuses Republicans of racism. So says Matthew Miller, a professor at the Harvard School of Public Health. "If you bought a gun today, I could tell you the risk of suicide to you and your family members is going to be two- to tenfold higher over the next 20 years," he told The Washington Post. Since the chance of a gun being used for suicide is so much higher than the chance of it being used to prevent a murder, we would all be better off with fewer firearms around. It's a rich irony -- as though smoke alarms were increasing fire fatalities. But the argument raises two questions: Is it true? And, when it comes to gun control policy, does it matter? Florida State University criminologist Gary Kleck says there are at least 13 published studies finding no meaningful connection between the rate of firearms and the rate of suicides. The consensus of experts, he says, is that an increase in gun ownership doesn't raise the number of people who kill themselves -- only the number who do it with a gun. That makes obvious sense. Someone who really wants to commit suicide doesn't need a .38, because alternative methods abound. Gun opponents, however, respond that guns inevitably raise the rate because they're uniquely lethal. Take away the gun, and you greatly increase the chance of survival. But in his 1997 book, "Targeting Guns: Firearms and Their Control," Kleck points out that "suicide attempts with guns are only slightly more likely to end in death than those involving hanging, carbon monoxide poisoning, or drowning." It's not hard to think of some other pretty foolproof means of self-destruction -- such as jumping off a tall (or even not so tall) building, stepping in front of a train or driving at 80 mph into a telephone pole. People who use guns are generally hellbent on ending their lives. So, deprived of a sidearm, they will no doubt find another reliable method -- rather than swallow a dozen aspirin and wake up in the emergency room. Banning guns is no more likely to reduce suicides than banning ice cream is to curb obesity. A few decades ago, various European countries changed the type of natural gas used for home heating and cooking -- replacing a toxic form with a harmless variety. That step eliminated one time-tested way of killing oneself. Alas, while the number of gas suicides declined, in most of these countries, the death toll didn't. The same pattern holds for guns. The National Academy of Sciences report noted that any link between firearms and suicides "is not found in comparisons across countries." The number of guns in a nation tells you nothing about its suicide rate. But let's suppose science could establish that people who obtain firearms do indeed increase their death rate (or the death rate of their family members) from suicide. So what? Buying a car may shorten your lifespan, since traffic accidents are a major killer. Building a backyard swimming pool creates a potential fatal hazard to you and your loved ones. But nobody says the government should interfere with such decisions. Personal safety is a far more central matter of individual autonomy than those choices. A mentally stable person living in a crime-ridden neighborhood should be free to judge whether she's more at risk from street criminals than from a spell of intense depression. Presumptuous paternalists argue that Americans should be deprived of guns because gun owners are their own worst enemies. A lot of Americans would reply: We can't trust ourselves, but we can trust you? OH: Robbery suspect gets shot at gas pumps: "An armed gunman who tried to rob a customer at a gas station wound up at Miami Valley Hospital after he was shot during a struggle with the intended victim. A man in his late 20s to mid-30s was filling up his vehicle at the Marathon station, Main Street and Ridge Avenue, at about 5:30 p.m. when another man at the gas pumps pulled out a gun, Dayton Sgt. John Riegel told News Center 7. A struggle ensued. "During the struggle, the suspect had the gun taken away from him and was shot in the hand," Riegel said, noting that the bullet is believed to have gone through the assailant's hand. His injury was not life threatening and he was taken to the hospital." MO: Police say Man Charged with Murder Was Being Robbed as He Sold Marijuana: "A University City teen killed Tuesday was robbing the man who shot him, according to St. Louis County Circuit Court documents. University City Police said in the report that Shawn N. Lackland, 21, provided a handgun to Eric Gray Jr, 16. Police said Lackland gave the handgun to Gray so he and Orlando McLamb-Rice, 19, could rob Otha Liggins, 23, of the 7400 block of Saleen, University City. Liggins met Gray and Rice to selling them marijuana, according to court documents. During the attempted robbery in the rear of 1089 North Hanley, Liggins shot Gray in the head, killing him, police said. Two weapons were recovered at the scene. One handgun was found next to Gray. The second handgun is believed to be the one used to shoot Gray." Conservative US Democrats have begun to desert Attorney General Eric H. Holder on the eve of a historic contempt of Congress vote, as Republicans upped the ante by planning to take Holder to court themselves if he doesn't hand over 1500 pages in documents on a failed gun-tracking operation. House vote counters predicted that 20 to 31 Democrats would desert their party largely because the influential National Rifle Association threatened to oppose lawmakers who support the attorney general. The House scheduled up to two hours of debate on Thursday before it votes on whether Holder, one of President Barack Obama's closest and most trusted cabinet allies, should be held in contempt. It would be the first time a sitting member of the president's cabinet has been held in contempt. Holder has repeatedly rebuffed a congressional subpoena to turn over 1500 pages of internal Department of Justice documents detailing his handling of the botched ATF Fast and Furious program. The House will consider two resolutions. The first would ask the US attorney in Washington to file a criminal case to force Holder to comply with the subpoena. The other would permit the House to hire an outside lawyer to file a civil lawsuit asking a judge to compel Holder to cooperate. Otherwise, a contempt resolution likely would die once it was sent to the US attorney, who works for Holder and likely would not force his boss to comply because Obama has asserted executive privilege to keep the documents sealed. Although the Republican-controlled House does not need Democratic votes to pass the contempt resolution, the fact that a growing number of Democrats may switch sides points to the volatility of the increasingly political situation. Two Democrats announced they would join Republicans in finding Holder in contempt for Fast and Furious, in which federal agents allowed 2500 firearms to be illegally purchased on the southwest border and two were recovered when US Border Patrol Agent Brian Terry was killed in December 2010. "The Terry family, the public and Congress deserve answers," said Representative Jim Matheson, a six-term Democrat from Utah. "Sadly, it seems that it will take holding the attorney general in contempt to communicate that evasiveness is unacceptable. It is a vote I will support." Representative John Barrow, a Georgia Democrat in his fourth term, said: "The only way to get to the bottom of what happened is for the Department of Justice to turn over the remaining documents." Then, he said, "We can work together to ensure this tragedy never happens again." Republican Representative Darrell Issa of California, chairman of the House Oversight and Government Reform Committee, has predicted that as many as 31 Democrats will vote with Republicans, based on the number of Democrats who joined Republicans a year ago asking Obama to direct Holder to cooperate with Congress. Other House aides put the likely number of Democratic defections at 20. But some conservative Democrats are remaining loyal to their party. "The House is rushing to judgment on this important issue," said Representative Jim Cooper, in his 11th term from Tennessee. He said Congress should wait for the Justice Department's inspector general to complete its investigation into Fast and Furious, which he said "is nearing completion". At the White House, spokesman Jay Carney reiterated the administration's stance that House Republicans are pushing contempt when they should be focusing on jobs and the economy. He said they "have made the strategic choice to try to score political points," and that "this is political theatre". A last-minute effort at compromise by White House and Justice officials was rebuffed by House Republicans on Tuesday. The administration officials showed them about 30 pages of the 1500 pages in question, and promised more if they would stop the drive toward contempt. Issa and the Republicans refused. Where did these hundreds of seized weapons come from? The deadly haul of guns collected from the streets of the West Midlands include an Uzi, AK47 and an exact replica of the handgun used by Saddam Hussain. 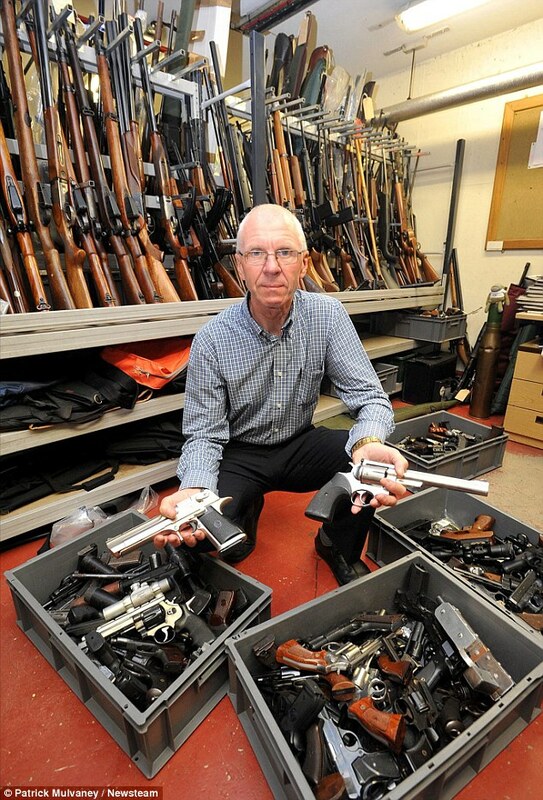 The myriad of over a hundred fierce firearms - some of which are modified or homemade - have been seized by, or been surrendered to, West Midland’s Police over the last 12 months. The cache of weapons are now being contained within a secure unit at a secret location by the force and are being used to train firearms officers. Pc Rob Pedley, a former firearms officer for 11 years, said: 'We obtain the guns through a variety of sources, many are seized but some are surrendered and handed in through amnesty’s and via other means. 'Some people have legitimately held licenses for rifles and decided to get rid of them - others we can perhaps connect to crimes or planned crimes. 'But each gun can be dangerous when in the wrong hands and we need to continually remind people of that fact. 'As a firearms officer, you have to very quickly assess situations and decide what the correct response is. The force said yesterday said that imitation guns, easily sought for just a few pounds from a variety of websites, can even be as dangerous as the real thing. Creating a problem so that they can make a bigger problem with their ham-fisted attempts to fix it is Big Government’s M.O. to a T.
No wonder Obama is willing to resort to the extremely desperate measure of inappropriately exerting executive privilege to keep F&F documents from becoming public. If they confirm that he explicitly approved providing weapons to foreign drug cartels so that he could use the inevitably ensuing bloodshed to undermine the Constitution he is sworn to uphold, he should be tried for treason. AR: Man shoots and kills woman (above), claims self defense: "Police were called to a robbery in the 2600 block of West 28th Avenue early Tuesday morning and found a woman dead. A man told police he shot the woman in self defense after she carjacked him. Ryan Bishop, 20, told police that 22-year-old Tarshara Banister jumped in his truck held him at gunpoint and took his wallet. He says she then ordered him to drive to an ATM where he says he was forced to attempt to withdraw money. Bishops says they fought over the gun and he shot Banister in self defense. Police are still investigating the incident." The importance of the 2012 US senate elections: "Obama and Secretary of State Hillary Clinton have put the United States Constitution and the Second Amendment in a precarious position. Hillary is pushing the United States to sign onto the United Nations 'Arms Trade Treaty' which, if ratified by the U.S. Senate, would put America’s gun rights under the regulation of the U.N. That’s reason number two why we must take back the Senate and get the gavel out of Harry Reid’s hands. But that’s still not all." CA: Man with permitted concealed weapon stops restaurant robbery: "A Vallejo man carrying a legal concealed weapon halted a reported robbery in progress at 6 p.m. Sunday at the Subway sandwich restaurant in the 600 block of Lewis Brown Road, Sgt. Jeff Bassett said. Bassett said a suspect entered the restaurant and ordered a sandwich, and when the clerk was finished with it, he brandished a knife and demanded cash. Meanwhile, the man, described as a 25-year-old Vallejoan with a permit for a concealed weapon, drew his gun and confronted the suspect who ran out of the restaurant before he was able to take anything, Bassett said. The suspect is described as a black man, 60, with long black hair who was wearing black clothing." UT: Herbert blames wildfires on … gun owners? : "Some of the wildfires scorching the West this year were sparked by unusual culprits: Gun owners. Or, more specifically, gun shooters. As with the Dump fire in Utah, which flared hard enough on Friday to force the evacuation of 1,500 homes and 9,000 people, nearly two dozen conflagrations, officials say, have started accidentally by careless target shooters whose bullet sparks touch off dried-up pinon and wild grasses." Lawyer: Zimmerman is no threat, should be released from jail at second bail hearing: "The jailed neighborhood watch volunteer charged with killing Trayvon Martin poses no threat to the community and should be released a second time on bail, his attorney said in a court motion released Monday. George Zimmerman’s attorney asked that Zimmerman be granted bond for a second time as he awaits a second-degree murder charge in the 17-year-old Martin’s shooting death during a confrontation in February in a gated community in Sanford, Fla. His attorney says Zimmerman isn’t a flight risk and stayed in touch with law enforcement during his initial release on bail. A judge will consider the request at a second bond hearing Friday." Last year was a banner year for proponents of gun carrying on college campuses. No fewer than 23 state legislatures saw bills introduced that would allow either faculty or students, or both, to bring firearms onto school grounds. The vast majority of the lawmakers in these states DECLINED to change their current laws on the subject. Rather than giving up the fight, supporters of college carry laws have been rejuvenated by recent school shootings and have brought the issue back around in 2012. In these 10 states across the country, the great debate rages on. Looser campus carry laws have been a subject of debate here since 2007, after the worst college shooting spree on American soil. State delegate Bob Marshall tried to get a bill passed in 2008 that would allow faculty members with permits to carry concealed guns on campus, citing the fact that it was a faculty member who saved several student lives by barring the door to the Virginia Tech shooter, although he himself was shot through the door and died. The bill failed, but Marshall revived it in 2012, only to have it defeated again. However, a recent court ruling that Virginia Tech had been negligent in its response to the school shooting could factor in to future attempts at passing a campus carry law. As it stands, Georgia law prohibits even students with permits from carrying guns on campus or keeping them in their dorm rooms. The weapons must stay locked in their cars. But a spate of violence at the end of 2011, coupled with another shooting at Virginia Tech, prompted legislator Stephen Allison to introduce HB 981 that would have allowed license holders to carry guns on campuses, plus in bars, school zones, government buildings, churches, the State Capitol … you get the idea. The bill failed, along with a bill allowing hunting with silencers and a bill letting owners of stolen guns used in crimes carry them without a permit upon their return. Arizona lawmakers have been plugging away at getting guns onto campus since last year, in the aftermath of a shooting that left six dead and nearly killed Congresswoman Gabrielle Giffords. SB 1467 made it to the House, where it passed 33-24, but Gov. Jan Brewer surprisingly vetoed it, saying it was “poorly written” and could accidentally make gun carriers lawbreakers. So Sen. Ron Gould reworked the bill and re-introduced it in 2012 as SB 1474. It died before getting to Gov. Brewer, but she vetoed another more general bill that would allow guns into all public buildings in Arizona. Since 2003, Colorado’s Concealed Carry Act has made it legal to carry a gun with a permit “in all areas of the state” other than federal buildings, K-12 schools, and a few other locations. College campuses were not exempt. However, the University of Colorado took the liberty of banning their students from carrying guns on campus. Members of Students for Concealed Carry on Campus sued CU and lost in 2009, but won their appeal in 2010. The latest development came from the State Supreme Court in March: CU’s ban violates the law. It appears the school will be joining Colorado State in letting students carry. Texas lawmakers attempted to sign three separate campus carry bills into law in 2011, to no avail. It was not a lack of political support that kept the bills off the books; the governor was vocally in favor of it, and two-thirds of the Senate and over half the House were on board. But the bills faced procedural problems, and key Democratic supporters backed out when they realized what a campus carry bill would mean for insurance rates for universities. One of the bill’s sponsors fully expects the issue to come up again in the next session, in 2013. Kansas is already a fairly lenient state for gun owners. Anyone with a permit can carry a concealed weapon into any public building that doesn’t have a “no guns” sign, an option all Kansas colleges seem to be taking advantage of. Enter House Bill 2353, The Personal and Family Protection Act. Under it, guns could only be banned from buildings with security measures like metal detectors. Despite strong opposition from campus police officers and others, the bill passed the House in March and was sent to the Senate. But the fight is not over; the Senate recently narrowly voted to shelf the bill indefinitely. Michigan gun proponents were thrilled in March at the news that a Senate bill had been drafted that would put an end to “pistol free zones,” which included college campuses, as well as ease restrictions on a number of other handgun rules. The bill had been promoted by the American Legislative Exchange Council, the group behind a Florida law that has been in the news quite a bit lately. But it doesn’t look like SB 59 will get the chance to cause any controversies — the head of Michigan Open Carry says the bill will die without leaving the Senate. This Spring, New Hampshire legislators took a hard look at gun laws. A bill that would prevent any publicly owned building (i.e. public universities) from banning firearms from their premises cleared the house 180-144. The governor pledged to veto it, calling it “uncalled for and unnecessary,” but the Senate made it a moot point by moving it into the purgatory of “further study.” The Senate also plans to study allowing gun owners to transport fully loaded guns, as well as a bill removing the need for a license to concealed carry. Oregon lawmakers and judges have made it clear in recent months that they support gun ownership, including the right to concealed carrying on college campuses. In September 2011, the Oregon Court of Appeals ruled state universities could not ban students with permits from carrying guns on campus. In this year’s legislative session, a last-minute bill banning guns on campus was barely defeated, 14-15. The House also passed its third bill in three years protecting concealed handgun license confidentiality, this year with the overwhelming “yea” vote of 24-5. After his bill requiring public colleges to allow guns on campus ran out of steam in the 2011 session, Sen. Jim Banks said he hoped to revisit the issue next year. And he did, resulting in “Preliminary Draft No. 3578.” The proposal was so short-lived that it didn’t even get to the bill-naming stage. Schools like Purdue and Indiana had strongly opposed the legislation, and for the near future at least, they and every other public university in the state will continue to ban firearms from their campuses in the absence of a state law regulating campus carry. OSHA targets shooting range: "The federal Occupational Safety and Health Administration has issued a citation, along with a proposed fine of $111,000 fine (OSHA press release here), against Illinois Gun Works–a gun store and gunsmith business which has a shooting range and teaches safety classes. Many of alleged OSHA violations at the safety training range involved noise exposure for the instructors. Among OSHA’s suggestions were to eliminate training in “larger caliber” handguns such as “9 mm Luger and/or .45 Colt” and substitute “handguns of smaller caliber,” such as .22LR. And “Prohibition of any shotguns and/or rifles firing in the firing range.” (p. 6). In other words, eliminate training for all firearms except those which are least likely to have the stopping power to be effective for self-defense. And ensure that the range can never provide students with personal instruction in the use of the firearms which constitute the vast majority of firearms which people actually own." OH: Off-duty officer kills robber: "A Toledo man was shot and killed after he tried to rob another man early Saturday morning. The man who opened fire in self defense is a Walbridge police officer, according to Toledo Police. Detectives say the officer and a friend were walking to the friend's home. Johnson confronted the pair at gunpoint demanding money. Police say that's when the off-duty officer pulled out his gun and fired, hitting Johnson at least once. Johnson was pronounced dead at the scene. No charges have been filed against the off-duty officer. He has been put on an automatic three-day leave while Toledo Police complete their investigation." 14-year-old Phoenix boy shoots armed intruder: "A 14-year-old boy shot and nearly killed an intruder who broke into his Phoenix home and pulled a gun on him while he was watching his three younger siblings, police said Saturday. The teen and his siblings, ages 8, 10 and 12, were at home alone when a woman rang the doorbell Friday afternoon, Phoenix police Officer James Holmes said. The teen didn't open the door because he didn't recognize the woman. Soon after, the teen heard a loud bang on the door, rushed his siblings upstairs and got a handgun from his parent's bedroom. When he got to the top of the stairs, he saw a man break through the front door and point a gun at him. The boy shot the 37-year-old man, who was taken to a hospital in extremely critical condition and underwent surgery. The man was upgraded to critical condition and is expected to survive and be booked into jail within the week on counts of aggravated assault and burglary, Holmes said. He said the suspect did not get a shot off. He declined to release his name until he is booked into jail. The woman who rang the home's doorbell got away." Off-Duty Cop Nabs Would-Be Robber at Gas Station: "An off-duty Chicago Police officer subdued a man who was attempting to rob a gas station with a BB gun Friday night in the West Loop. Donald K. Davis [above], 23, of the 7600 block of South Morgan Street, was charged with attempting to disarm a peace officer and attempted armed robbery, both felonies, police News Affairs Officer Robert Perez said. Davis, wearing a skull cap and a facial covering, entered a gas station in the 1100 block of West Van Buren Street at 9 p.m. and announced a robbery, Perez said. He was holding a handgun when he ordered the 19-year-old male gas attendant to put money in a bag, Perez said. An off-duty police officer that happened to be inside the gas station, told Davis he was an officer and attempted to arrest him, Perez said. Davis tried to escape and attempted to disarm the officer. With the help of the gas attendant, the officer maintained control of his gun and subdued Davis until arresting officers arrived." KS: Homeowner shoots would-be robber in arm: "A Wichita man shot a would-be robber in an early morning home invasion, police say. Wichita police Sgt. Jim Pinegar said a 64-year-old man walked into a house in the 3000 block of E. First Street, near Hillside, shortly after 3 a.m. Saturday. The resident of the home fired two shots at the other man using a .45-caliber gun, Pinegar said. One shot hit his arm. The man fled to a nearby Kwik Shop, according to a Sedgwick County dispatch supervisor. Within minutes, someone at the store called 911 to report a gunshot victim on scene. The resident of the house — a 60-year-old man — also called police, the dispatcher said. Pinegar said he did not know the invader. The alleged burglar was taken to Wesley Medical Center for treatment. He sustained serious injuries, the dispatcher said." Jumping the gun: "Saying he's lost the trust of officials, a city manager fired a central Florida police chief who was criticized for his agency's initial investigation of Trayvon Martin's shooting death at the hands of a neighborhood watch volunteer. Sanford City Manager Norton Bonaparte says in a Wednesday statement that he relieved Chief Bill Lee of duty because he "determined the Police Chief needs to have the trust and respect of the elected officials and the confidence of the entire community." The initial lack of an arrest following the death of the unarmed black teenager by neighborhood watch volunteer George Zimmerman in February led to protests across the nation and spurred a debate about race and the laws of self-defense." Was Obama himself up to his ears in "Gun Walker"? With the options available, why did Obama choose to invoke executive privilege? That, at least to me, is the pregnant question. He had a number of other options but 4 months from a critical election, chose the most controversial and potentially damaging one. Why? "Even with his fawning press, [President Obama] will pay a price for this one. He knows this, meaning that the documents now to be withheld must be dynamite. They have to show either that Holder knew what was going on with Fast and Furious and approved it, or that he directly committed perjury in his Congressional testimony, or both. I just can’t see any other explanation for such a risky move. Wasn’t the Washington Post just covering big time the 40th anniversary of Watergate? I wonder how much coverage this one will get." That’s the result of the move – speculation that the documents being withheld point to perjury by Holder or the President, or both. So let’s break this down a bit. If it was all about Holder, why would the president risk this sort of a controversial move this close to an election. It’s not like he’s never thrown anyone under the bus. In fact James Carville is on record advising Obama to dump Holder. Obama had the option, then, of letting Holder face contempt charges (not much happens as we’ve seen in the past, to those who are served with contempt of Congress charges) and drag out the document release until after the election. With the election season gearing up, it is likely that while the controversy would have been an issue, it wouldn’t have been a major issue. Now it certainly is. He could have asked Holder to resign. He could have then used the opportunity to appear as a statesman, a leader and bi-partisan all in one fell swoop. Depending on how he handled that it could actually have been a positive for him heading into an election. In the meantime, an acting AG could continue to delay on providing documents. But he did neither of those things. For some unknown reason (at least to this point) he chose to do the least likely and most politically damaging thing – invoke executive privilege. As the lawyer quoted has said, those documents must be “dynamite” to have the president make this move. And, unsaid by the lawyer is the speculation that the documents show the involvement of the White House to a degree that is damaging – apparently more damaging than the speculation and attention this move by the President has brought. New York State legislators are pushing through firearm microstamping legislation (A.1157B) which intentionally creates firearm manufacturing rules so difficult to implement that most firearms manufacturers just won’t bother selling into New York anymore and those few left making guns in New Y0rk are likely to leave. New York already has some of the toughest gun laws in the country, but has failed to see any real reduction in violent crime. So instead of fixing the real issue (law maker’s and law enforcerment’s inability to end inner-city crime) they go after a popular target: gun makers and gun owners. Micro-stamping forces gun makers to manufacture and install firing pins with the ability to create tiny stamps on the cartridge casings of the rounds they fire. This is a burden on the manufacturer and on the first person to buy the weapon (which is often a dealer, not the actual first owner). Firearm microstamping is a revolutionary forensic technology that produces an identifiable alpha-numeric and geometric code onto the rear of the cartridge casing each time a semiautomatic pistol is fired. - As the microstamp is only on the casing (the part of the cartridge that holds the bullet) anyone planning to commit a crime would simply go to a New York shooting range, pick up the fired brass, use those mirco-stamped and reload them. Then then the craft criminal could blame his crime on YOU. - If you decide to replace your pistol’s firing pin with a titanium striker or other match grade device, you’ve just committed a crime – no more competition upgrades for New Yorkers. The law is obviously not about tracking firearms or cartridges. The law is about making it impossible for firearms manufacturers and retailers to survive in New York. Lately, firearms businesses have been moving to Texas and the Mid-West in droves. Tens of thousands of American manufacturing jobs are being shunned by New York Democrats like Assemblywoman Michelle Schimmel. What’s more important? Keeping guns out of the hands of law abiding citizens or keeping jobs in a state that sorely needs them? New York residents have two choices: Decide that any rightful New Yorker should own a firearm or agree with the Democrats that only the criminals should have guns. This law will only prevent lawful ownership of firearms as the gun industry continues to move out of over-regulated states and gun dealers find other locals in which to make money. If you live in New York and think that Ms. Schimmel is wrong, let your state legislator know before it’s too late. Australia: Robber dies after crooked cop supplies gun: "A FORMER NSW policeman will spend up to five years in jail for providing a pistol used in a botched armed robbery on Sydney's northern beaches. Franjo Vlado Santalab showed no emotion as the sentence was read out by NSW District judge Richard Cogswell on Friday, but nodded and quietly agreed "yes, your honour" when asked if he understood the punishment. The 34-year-old pleaded guilty at earlier hearings to being an accessory before the fact to the attempted robbery of a Brinks cash security truck outside Dee Why RSL in July 2011. The key player in the hold-up, Nathan Brodbeck, 32, a former Brinks employee, was shot dead by a Brinks guard as he brandished Santalab's Glock nine millimetre pistol and demanded $750,000 from inside the truck. He died at the scene after being shot in the chest." WA: Burglar shot with shotgun: "A Tacoma man who shot a burglar in the face with a shotgun Tuesday night likely won’t be charged with a crime, Tacoma police and Pierce County prosecutors said Wednesday. Police said the shooting occurred about 6 p.m. at South 14th and South Madison streets, as a burglar tried to enter the home through a window. The wounded suspect, 19, remained at St. Joseph Medical Center, Fulghum said. No charges will be filed until the investigation is completed, he said. A congressional committee has voted to hold United States attorney-general Eric Holder in contempt of congress for not releasing critical documents which reviewed a failed gun trafficking investigation. Over a two-year period US federal agents allowed more than 2,000 guns to cross the border into Mexico, in an operation known as "Fast and Furious". The agents hoped to track the guns to a drug cartel but lost track of most of them. A committee investigating the botched operation asked Mr Holder to release all relevant documents. He released thousands of documents but said certain other documents were classified and it would be against the law to release them. In a party-line decision, the committee voted 23 to 17 to have him held in contempt of congress. Darrell Issa, a Republican congressman from California, said the operation contributed to the deaths of countless Mexican citizens. "It has soured our relationship with our neighbour to the south," he said. "It has created an ongoing safety problem here in the United States in which even the attorney-general has admitted more lives could be lost. "The Department of Justice has fought this committee's investigation every step of the way." The committee will now send its report to the floor of congress for a full vote on its adoption next week. An official charged with contempt could be punished with a fine or jail, but the more likely result is weeks or months of controversy feeding into the presidential election campaign. The vote came after an intervention from president Barack Obama, who invoked executive privilege to allow Mr Holder to withhold the documents. It was Mr Obama's first use of executive privilege in response to a congressional investigation. Republicans have used the situation to portray Mr Obama as a participant in a cover-up. "Until now, everyone believed that the decisions regarding Fast and Furious were confined to the Department of Justice," said Michael Steel, a spokesman for House speaker John Boehner. "The White House decision to invoke executive privilege implies that White House officials were either involved in the Fast and Furious operation or the cover-up that followed." Trey Gowdy, a South Carolina Republican and former federal prosecutor, said it had been a sad but necessary day. "The notion that you can withhold information and documents from Congress no matter whether you are the party in power or not in power is wrong," he said. "Respect for the rule of law must mean something irrespective of the vicissitudes of political cycles." Even before the vote, the White House criticised the panel. "Instead of creating jobs or strengthening the middle-class, congressional Republicans are spending their time on a politically-motivated, taxpayer-funded election-year fishing expedition," White House communications director Dan Pfeiffer said. TX: Clerk shoots fleeing robber: "The clerk said he was behind the counter at B&J Grocery in the 2800 block of Chihuahua Street about 1:45 p.m. Tuesday when a man walked into the store, bought some items and left without incident. He told police the man returned to the store and brought an 18-pack of beer to the counter. As the clerk was ringing up the purchase, the robber punched him in the face and opened the register. He ran away from the store with cash and the 18-pack, the clerk said. The employee said he reached for a .38-caliber pistol and fired five rounds at the man, but was unsure if he hit him. Police caught up with a man who matched the suspect's description and who had been shot in the abdomen and hip. The suspect, Edward de Leon, 37, was taken to University Hospital with injuries not considered life-threatening." FL: Owner of gold store shoots alleged robber: "A man who police say robbed a business on Archer Road that buys gold got the worst of the deal Wednesday afternoon when the owner followed him outside and shot him in the leg. About 15 minutes after the shooting, a man identified as Kouvaris Roberts, 23, showed up at North Florida Regional Medical Center dressed only in boxer shorts with a gunshot wound to his right thigh. The Gainesville Police Department was alerted, and officers arrived at the hospital to detain Roberts for the attempted robbery. Police say Roberts demanded cash and gold from owner Timothy Howlett at gunpoint. Robbers left the store and Howlett followed, police said. At that point (Roberts) points his gun at (Howlett), and that’s when he shot,” said GPD spokeswoman Cpl. Angelina Valuri." AR: Manager Pulls Gun on Alleged Teen Robber: "A teen was arrested Tuesday night in Fort Smith after police say he attempted to rob Chaffee Liquor with a knife. The store manager pulled a gun on the attempted aggravated robber then called police. Cpl. Steven Dooly says the 16-year-old went into Chaffee Liquor on the corner of Massard and Zero Street around 8:20 p.m. Manager Jerry Hurlocker told police the teen walked to the counter with a folding lock blade knife and threatened him with it saying, ‘Give me all your f—ing money!’ according to the report. After a second threat, Hurlocker reached under a shelf and picked up his revolver. He then pointed it at the boy and told him to drop the knife, said Cpl. Dooly. Police say the teen dropped the knife while Hurlocker called 911 and held the suspect at gunpoint until officers arrived"
Va: Pizza delivery driver shoots, wounds stun-gun wielding bandit: "A pizza delivery driver shot and wounded a stun-gun wielding man who had tried to rob him early today, Richmond police said. Police responded about 2:16 a.m. to a shooting in the 00 block of East Broad Street, officials said in a news release. After officers arrived, they learned that the victim had been shot after he tried to rob the pizza delivery driver, who fired in self-defense. The driver, 33, was not injured. Michael T. Caballero, 19, who police said had no fixed address, was charged with robbery and two counts of possession of drugs with intent to distribute. Caballero was taken to a hospital with non-life-threatening injuries, police said." Bang! Was that “gun violence” or self-defense? : "'Gun violence' hand-wringers love to propagandize multi-victim shooting sprees in schools, malls and other oxymoronic 'gun free zones' but they never seem to consider just how many lives might have been saved from 'gun violence' if an honest, armed citizen had been there to put the shooter down. What's lost in the whole 'gun violence' mania is that guns aren't violent; people are violent." Federal judge strikes down part of Chicago's gun law: "Chicago's firearm ordinance took another blow Tuesday when a federal judge ruled that the section banning permits for people convicted of unlawful use of a weapon is vague and unconstitutional. The city must now decide whether to appeal the ruling or rewrite the part of its gun ordinance that bars individuals convicted of even misdemeanor offenses from possessing a firearm in their home for self-defense. The ruling came in a lawsuit filed by Shawn Gowder, who claimed his constitutional right to bear arms was violated when he was denied a firearm permit two years ago because of a misdemeanor conviction for possessing a gun on a public street. The lawsuit, backed by the National Rifle Association, is one of at least five cases pending against the city's gun ordinance"
NY: Security guard shoots man who had threatened him: "One thing is not in dispute. A security guard t the Gibbs Place Apartments shot his weapon twice Friday night, severely wounding a 32-year-old man. Witnesses say Paul Ravenel charged the security guard with a knife earlier that night. After he was disarmed he vowed to come back again with a gun. Police were called, but an arrest never happened. Reasons why are unclear. What is clear is that Ravenel made good on his threat to return to the apartments on Chestnut Street in Rochester. Rodgers says Ravenel returned to the scene carrying a black bag and reaching inside it. He described how the man ignored the security guard’s directive to step back. Ravenel was shot twice as he raised the bag with his hand. Inside the bag was a hammer. Cruz-Romero has been charged with assault. A grand jury will determine whether the case will move forward or whether this is a case of self-defense." SC: Deputies say Woman Shoots Ex-Husband In Self Defense: "Laurens County deputies say a woman who admitted to shooting her ex-husband will not be charged in the shooting because they believe she acted in self defense. Tammy Duvall told deputies she had a friend over at her house and was about to go outside when she heard a car door shut. Duvall told deputies she grabbed a gun and shot several times when she noticed her ex-husband, Roderick Woodruff, charging towards her. Deputies later found Woodruff injured at his home and took him to the hospital. Roderick Woodruff will be charged with criminal domestic violence 1st offense. Woodruff was charged in April with CDV 1st offense and kidnapping with the same woman." MI: Gun-toting advocates protest charges against teen in Birmingham: "Gun toting advocates filled the Birmingham commission chambers Monday night, displaying their firearms in holsters and strapped to their backs in protest of charges against a teen they say had the legal right to do the same in public. At issue is the April 13 arrest of Sean M. Combs, a Troy High School student, after he strolled Old Woodward Avenue in downtown Birmingham with a M-1 rifle strapped to his back. He faced three misdemeanor charges for brandishing a weapon, resisting and obstructing police, and disturbing the peace -- each punishable by up to 93 days in jail." The basic requirements for self-defense: "The best gun skills in the world wouldn’t do you a bit of good in a violent attack unless you had the time and mental preparation to bring your gun into action -- or take other evasive, defensive steps. Being aware of your surroundings at all times, and paying attention to your gut feelings and instincts, is just as important as the ability to hit what you shoot at -- and maybe more." Why do Liberals and Progressives want you Disarmed? : "Courts throughout these United States have consistently held that police have no legal duty to provide police protection to any individual citizen. That being the case, then there must be some other reason why liberals and progressives want the American people disarmed. In my mind, the answer is a no brainier; they know the only way they can force their statist policies down the throats of the American people is through the power of government and their biggest fear is the people will eventually draw a line in the sand and resist. Statists worship at the altar of government and believe individual liberty is subordinate to the power and dictates of the state. An armed populace scares the hell out of these people. That is why they constantly misrepresent and demonize the right to keep and bear arms." Polls: Public opinion on George Zimmerman shifting: "For weeks, the death of Trayvon Martin, the investigations it launched and the civil rights rallies it spurred were the most important news stories in the country, according to pollsters. At least six news organizations or polling companies did surveys. What they documented, in general, was that people were fascinated and outraged by the Feb. 26 death of the unarmed 17-year-old and angry at the shooter, Neighborhood Watch volunteer George Zimmerman. And as time has passed and more evidence has been released, people’s feelings about Zimmerman have eased. In late March, while people were still marching in the streets demanding his arrest, 33 percent of the country believed Zimmerman was guilty of murder, according to a poll by Rasmussen Reports. The same poll showed that fewer than half that number – 15 percent – believed Zimmerman had acted in self-defense. Two months later, however, those numbers had flip-flopped. In a May 19-20 Rasmussen poll, 40 percent said they believed Zimmerman had acted in self-defense vs. 24 percent who called him a murderer." Israeli driver attacked; kills 2 Palestinians, wounds 1: "An Israeli tow truck driver shot dead two Palestinians and wounded one Sunday during what police said was an attempted car robbery in the West Bank. Israeli police spokesman Micky Rosenfeld said the Palestinian men ambushed the Israeli's vehicle and beat him over the head with chains and bars before the driver opened fire in self-defense. He said the driver is being treated for head wounds at an Israeli hospital, and a police investigation is continuing. The Palestinian men have criminal records, according to Palestinian police. The two men died from gunshot wounds to the head and chest, said Ziyad Abu Zahara, acting director of a hospital in Hebron in the southern West Bank. The incident occurred near the city." SC: Two shot in attempted robbery: "Two people were shot Thursday afternoon during what appears to be an attempted robbery inside a residence at Mt. Zion Apartments on Church Street. “The man was expecting one visitor, who brought two other guys along with him,” Maj. Carlos Raines, Florence Police Department, said. “Soon after they got there, they pulled out guns and went to rob him. There was a struggle, and in the process, one of the suspects was shot.” At some point during the struggle, the suspects regained possession of the gun and shot the intended robbery victim. The three men then ran from the apartment, Raines said. Police said the suspect who was wounded was at an area hospital being treated. Both men who were injured are expected to recover." MI: Afraid for his life, man pulled gun, killed acquaintance: "Adham Farha went outside to smoke a cigarette. Minutes later, as children waited at the school bus stop across the street, the quiet neighborhood was shattered by gunshots. Farha had jumped out of his Nissan Armada, parked in the driveway of his home and — as the children watched — fired numerous shots inside, killing Michael Rajchel, who was sitting in the front passenger seat. Farha told police it was self-defense. The two men had gotten inside Farha's SUV to talk. When Rajchel reached for the gun tucked inside his waist band, Farha did not hesitate to fire. “While Mike was leaning backward (in the passenger seat) he stated that, ‘This is your last day to live,’” McCormick wrote in the police report. “Farha stated he did not know how many times he shot Mike but that he feared for his life.” Multiple witnesses alleged Rajchel was involved in fraudulent activities involving selling and reselling cars, the report revealed. Rajchel died in the passenger seat of the car. He was 28. Washtenaw County Chief Deputy Assistant Prosecutor Steve Hiller said at the time that there was not enough evidence to show Farha didn’t act in self-defense." OH: Grand jury refuses to indict man in recent killing: "A man who proclaimed his innocence in the shooting of another man during a drug deal was released from jail a free man Thursday. The Allen County grand jury declined to indict 18-year-old Deshawn Porter. He was charged with murder in the shooting death of 19-year-old Isiah Smith, of Columbus, on May 20. “Based on the evidence we were able to present through witnesses to the grand jury no indictment could be returned at this time,” Prosecutor Juergen Waldick said. The investigation remains ongoing and it's possible Porter could be recharged should more evidence surface. Investigators believe he is responsible for Smith's death, Waldick said. At an earlier hearing, it was revealed Smith died during a drug deal in which he pulled a gun on Porter and 35-year-old Santario Simpson. Simpson grabbed the gun and Smith to try to get the gun away from him, a detective said." Slow, predictable hearing on “Fast and Furious”: "The show trial of U.S. Attorney General Eric Holder on a citation of 'contempt of Congress' for refusing to comply with a congressional subpoena is scheduled to climax on June 20. That's when the investigating Oversight Committee has called for a vote on whether to move forward with a criminal contempt citation. Holder may be guilty but, the hearing is a show trial because no one realistically expects a criminal prosecution or conviction." OK: Suspect Shot After Trying To Steal Tip Jar: "According to a police report, a man and his friend were playing pool at Chester's Pool Hall near N.W. 50th Street and N. May Avenue on June 10. The man saw two people walk up to a counter, steal a tip jar filled with cash, and walk toward the exit. The witness told the manager what he'd seen, and the manager went outside to confront the men. The manager and one of the suspects physically struggled over the tip jar. When a second person came out to help the manager, the suspect told his friend to shoot them. Witnesses said the other suspect, identified as 18-year-old Jesus Perez, pulled out a gun and opened fire. The manager then pulled out his own gun and started shooting. Both Perez and the manager were hit by gunfire, but neither was seriously hurt. The other suspect threw down the tip jar when the manager pulled out a gun, but witnesses said he then went to grab the gun Perez had dropped. Before the second suspect could reach the gun, police arrived. Officers arrested Perez and a 16-year-old suspect. They were booked into jail on a complaint of robbery with a firearm." TX: Man shoots intruder during apparent robbery: "A Haltom City homeowner shot and killed an intruder who beat and tried to rob him and his girlfriend over the weekend. Police were dispatched about 6 p.m. Sunday in response to a burglary call at a home in the 5300 block of Mallory Drive. The suspect, identified as 23-year-old Jerome Mitchell of Fort Worth, entered the home and struck the two victims with a blunt object, the homeowner told police. The homeowner, who was not identified, grabbed a gun and shot the intruder in self-defense, he said. Mitchell later died from his injuries. The case will be referred to a grand jury for review, according to Haltom City police." ID: Firearm-friendly towns in Idaho lure gun makers: "Detroit is known for cars, Los Angeles for its stars, now small towns in Idaho are trying to become gun towns. But it’s not exactly a return to the Wild West: The goal is to get people working again. 'It’s gonna create some jobs,' says David Brown, mayor of Potlatch, Idaho. 'We can stay here, our kids can stay here and live and work.'" WA: Homeowner cleared after fatal shooting: "A Newman Lake homeowner did nothing wrong when he shot his girlfriend’s ex to death after the irate man showed up at his house with loaded guns last month, according to prosecutors. Spokane County prosecutors said Tuesday that no criminal charges will be filed against Doug Snarski, 55, for the homicide of Sean Parsons on May 13. Parsons, 43, was armed with a shotgun, handgun and an ammunition-stocked belt when he entered Snarski’s home early that morning and said he planned to kill everyone. Snarski called 911 and left the phone on as the confrontation with Parsons ensued. Dispatchers heard the gunfire that killed Parsons. “There’s no surviving this. You’re dead,” Parsons told Snarski, according to a recording of the call released Tuesday. “There’s nothing you can do.” The recording begins with Snarski yelling at Parsons to leave after Parsons apparently fired a shotgun. About 2 1/2 minutes into the call, three gunshots rang out. “I told you you were making a mistake!” Snarski yelled at Parsons. Snarski said he fired at Parsons as soon as he reached the top of the stairs." MI: Gun-toting advocates protest charges against teen in Birmingham: "Gun toting advocates filled the Birmingham commission chambers Monday night, displaying their firearms in holsters and strapped to their backs in protest of charges against a teen they say had the legal right to do the same in public.At issue is the April 13 arrest of Sean M. Combs, a Troy High School student, after he strolled Old Woodward Avenue in downtown Birmingham with a M-1 rifle strapped to his back. He faced three misdemeanor charges for brandishing a weapon, resisting and obstructing police, and disturbing the peace — each punishable by up to 93 days in jail. In April, Birmingham Police Chief Don Studt acknowledged the constitutionality of Combs' decision to carry his gun, but said "this guy was creating a disturbance and he wouldn't cooperate." NY: Man pulls out shotgun for self protection: "While he doesn't want to reveal his identity, a Guilderland homeowner wanted to send a message about self protection in the home, after an intruder reportedly pounded and yelled outside his door. He wished he'd never opened the door just after four in the morning Sunday, to a man pounding and demanding money. Albany County sheriff Craig Apple says 20-year-old Cody Lassonde, an active duty Marine from Altamont, was intoxicated when he pushed his way into the home on Veeder Road. The wife inside called 911. The husband grabbed this 12-gauge shotgun, a Remington 870 used for hunting. "At that point, I felt my only means of protection. I'm not going to get into some hand to hand combat with somebody," he said. The homeowner said they managed to get Lassonde out of the house and locked the door, standing on one side with the shotgun poised, as Lassonde banged and shouted to get back in. That's when deputies arrived, wrestling Lassonde to the ground and tasing him for the arrest, saying the Marine blew a point one seven after the incident." MI: Robber with plastic gun shot dead: "Joubran was working behind the counter at Jules Market on Flint's east side March 21, 2011, when he said two men came in and announced a hold up. In a flash from Joubran's .38-caliber pistol, 19-year-old Don Mitts was dead as the other robber fled from the store. “Nothing goes through you head,” Joubran said of firing the fatal shot. “Maybe because you don’t know what’s going to happen; I don’t think you really think about it.” Despite having no available surveillance footage of the shooting, Flint police Sgt. Jeff Collins said the case was fairly straightforward. “He was still clenching the money and the gun when he was on the floor,” Joubran said. Authorities ruled that Joubran was justified using lethal force during the shooting"
MO: No charges for shooting road rager: "No charges will be filed against a 65-year-old grandfather who shot a motorcyclist in a road rage incident last month. St. Charles County prosecutor Jack Banas said that under Missouri's so-called castle doctrine law, the grandfather was justified in using potentially deadly force because the motorcyclist reached into the grandfather's car and punched him. The motorcyclist was shot in the upper left chest and is recovering, authorities said. When the male motorcyclist approached the grandfather's car on foot, the grandfather took his semiautomatic .380-caliber handgun out of his glove box and placed it in his lap, Banas said. They continued arguing, and the grandfather said the motorcyclist spit at him and he may have spit back. After that, the motorcyclist punched the grandfather in the face, and the grandfather then fired one shot at the motorcyclist"
FL: Robbery suspect shot and killed by victim: "A man who tried to rob a couple returning home early Sunday morning was shot and killed, PBSO said. The couple, who live in the 5100 block of Palm Hill Drive, were walking to their apartment about 2:12 a.m. when a man with a gun approached them, police said. The unidentified man ordered the couple into their apartment and followed them. As he searched their things, the man with the gun and the male victim began to fight. The male victim grabbed the gun and shot the suspected robber, police said. The suspect ran from the apartment and collapsed on the walkway nearby, police said. The suspect was pronounced dead by Palm Beach County Fire Rescue. The names of the dead man and the couple were not released Sunday morning." GA: Intruder shot at business after pulling gun on owner: "A 55-year-old Athens man was in critical condition Sunday after he was shot by the owner of a Westside check-cashing business who fired in self-defense when the man pulled a gun, Athens-Clarke police said. Donald Collins was under police guard Sunday afternoon in the intensive care unit of Athens Regional Medical Center, where was treated for gunshot wounds to his face and head, police said. Collins was shot Saturday morning by the 75-year-old owner of Classic Cash, 2141 W. Broad St., police said. While preparing to open the business shortly before 9 a.m., the owner opened a side door to let in an employee when he noticed a man wearing a hooded sweatshirt run across the parking lot, police said. The owner got his licensed handgun and opened the door to find out what the man was up to, police said, as Collins ran into a storage room attached to the business. The business owner alerted Collins that he was armed and called for him to show himself. When Collins came out pointing a pistol at him, the businessman fired his gun three times, striking Collins twice"
FL: Business owner thwarts robbery attempt, suspect shot dead: "Pasco County Sheriff deputies are investigating an attempted robbery at Justice Coin in New Port Richey Sunday. Wayne Justice, the store owner, was stabbed when the suspect entered his store. Once the suspect stabbed Justice, he pulled a gun and shot the suspect, Jacob Stanborn, 25, in the chest. Stanborn died in front of the store from the gun shot wound. Justice's injuries were not life threatening. Deputies reported that Stanborn and Justice knew each other through the store. No charges are expected in the case." CA: Black Gang Member Arrested In Pharmacy Robbery: "On Thursday, an armed suspect walked into Stockton Pharmacy demanding money. Jermaine Smith, 31, allegedly walked into the pharmacy, in the 3300 block of E. Main Street, and told everyone to drop to the ground while attempting to rob the store by demanded money from an employee. The employee grabbed a gun and shot at Smith; at which point, he fled the area in a vehicle. Stockton police responded to a call regarding a shot African-American male matching Smith’s description in North Stockton. He was arrested and treated overnight at an area hospital. Smith, a Stockton resident, is a known gang member and currently on parole for robbery. He was booked into San Joaquin County Jail for robbery, weapon charges and violating his parole." TX: Woman bests black intruder with paintball gun: "A Galveston woman used a paintball gun to detain an intruder long enough Friday for police to arrest him, according to the Galveston County Daily News. When officers arrived about 10:30 a.m., they heard the sound of the paint ball impacts and found the man inside covered with yellow paint, the Daily News reported. Elvis Alexander, 53, was charged with burglary of a habitation with intent to commit theft, said Lt. Michael Gray, a Galveston police spokesman. According to online records, Alexander remained Saturday in the Galveston County Jail on $40,000 bond. He was accused of taking coins and Ramen noodles from inside the house in the 1100 block of 36th Street, according to the Daily News"
AK: Jury acquits 3 men charged with first-degree murder: "An Anchorage jury found three men not guilty in the shooting death of another man in a busy South Anchorage mall parking lot in 2009. Dawud Johnson, Ajamu McCoy and Jerry Lynn Taylor Jr. were charged with first-degree murder and evidence tampering in the death of Joe Alfred Young Jr. Lawyers for the three men argued their clients shot Young, 23, in self-defense. Prosecutors said the shooting was over a stolen necklace. With his dying words, Young told police a man named "Cole" had him killed. Detectives later said Young had snatched a flashy medallion from the neck of a record producer and drug dealer named Naron "Cole" Celestine. The shooting was retribution for the theft, police said. Defense attorneys for Johnson, McCoy and Taylor said that Young ambushed the trio and they shot back to protect themselves. Celestine is serving a 15-year federal sentence for conspiring to distribute cocaine. GA: Self defense shooting ends badly: "After the service concluded, Henderson got into a fight with some others just outside the church. William Miller, DeKalb County public safety director, said, "This group assaulted him. He managed to get to his car after escaping them. He got a gun. He fired. Don't know if he was trying to fire in self defense. And then someone else got a gun, shot and killed him." Henderson exchanged gunfire with Deimetrius Heard, 28. Henderson was shot four times while Heard took two bullets. Both men died." Attorney General Eric Holder clashed Thursday with congressional Republicans seeking more information about a flawed gun-trafficking investigation in Arizona. Lawmakers at a House Judiciary Committee hearing asked Holder what he knew in advance of public disclosure of a so-called gun-walking tactic in early 2011. As part of Operation Fast and Furious, agents were told to forego immediate arrests of suspected straw purchasers of guns and instead try to track the guns to higher-ups in gun-smuggling rings. Such a tactic is normally barred under Justice Department policy. Agents lost track of hundreds of guns which flowed south to Mexico, where many were recovered at crime scenes. Two such guns were found in the U.S. at the scene of the killing of border agent Brian Terry. Holder told the committee he became aware of the gun-walking tactic at the same time as the public and that he found out "about the same time" that guns found at the scene of Terry's death were part of Operation Fast and Furious. Holder has faced off repeatedly with Issa and other Republicans in recent months over his handling of the aborted firearms investigation. Issa's committee has prepared a contempt citation against Holder but not voted on it yet, applying pressure for more documents on Operation Fast and Furious. Holder said the Justice Department has cooperated fully with congressional investigators and turned over 7,600 pages of material to Congress about the operation. "Look, I don't want to hear about the 7,600," snapped Rep. Darrell Issa, R-Calif. Chairman of the House Oversight and Government Reform Committee that is investigating the operation, Issa has been Holder's frequent sparring partner during recent gun-walking hearings. Issa said Thursday that wiretap applications in Operation Fast and Furious indicate that a number of key individuals at the Justice Department were responsible for the use of the gun-walking tactic. "I've read them," replied Holder, adding that he disagreed with Issa's conclusions. The material on the wiretaps is sealed in a federal court, but Issa said the committee obtained the applications from whistleblowers cooperating with his investigation. Gun-walking has long been barred by Justice Department policy, but was used in the Arizona operation in an effort to dismantle entire arms-trafficking networks and reach kingpins who had long eluded prosecution. Previous law enforcement strategy had focused on prosecuting low-level illicit arms buyers at the bottom of the chain, but that allowed thousands of weapons to reach Mexico. The gun-walking tactic was first used in two similar operations during the George W. Bush administration. Committee chairman Lamar Smith of Texas asked for the identity of the highest-level official in the Obama administration who knew gun-walking was taking place. Holder replied that the operation began in law enforcement offices in Arizona and that he was not at all certain beyond that. I don't think anybody in Washington knew about those tactics," said the attorney general. The Justice Department's inspector general is looking into who knew. "How many people in Mexico have been killed as a result of the U.S." engaging in the gun-walking tactic? asked Rep. Ted Poe, R-Texas. "I don't know, but I think there would be some," replied Holder. The attorney general pointed to a broader picture: That 68,000 guns recovered by Mexican authorities in the past five years have been traced back to the United States. Operation Fast and Furious involved about 2,000 guns in total, and agents lost track of about 1,400 of those. TN Governor Signs Trio of Anti-Crime Bills: "Tennessee Gov. Bill Haslam signed a trio of anti-crime measures into law during a Wednesday, June 6, visit to Bartlett. The laws include an increase in mandatory jail time for repeat domestic violence offenders and a second law upping sentences for convicted felons with guns that include some specific circumstances for longer sentences. The third law makes aggravated assault, robbery and aggravated burglary a higher class of felony with a longer sentence when committed by groups of three or more people. The law is aimed at gang violence. The felons with guns bill that passed in the Tennessee Legislature earlier this year is the second in as many years to become law." CA: Suspected intruder shot while coming through child’s window: "A man suspected of trying to break into a home on the 300 block of Berkshire Ln. in Stockton on Sunday was shot by the homeowner while trying to enter the house.Stockton police reports indicate the homeowner was awoken around 3:00 a.m. by strange noises at the property. Upon investigating, he saw 23-year-old Yobenrico Well coming in through his child's bedroom window. Fearing for the safety of his family, the homeowner shot Well who fled on foot, according to police reports." AL: Man, 72, shoots intruder: "The man told investigators that he was awakened by a 27-year-year old man pounding on his back door at 2 a.m. The younger man knocked him to the ground and forced his way inside when he opened the door, said Tuscaloosa County Metro Homicide Unit commander Capt. Loyd Baker. The suspect ran back into the yard when he realized another person was inside the home, Baker said. The resident retrieved a gun and fired a shot at the suspect." TX: A warning shot is a crime? "In this strange occurrence, the homeowner woke in the night to hear burglars on his property. The burglars were attempting to break through his fence. While his wife remained in the house, he went out of his house and yelled at them to leave. He then fired a “warning shot” into the ground. The burglars fled. The case became convoluted when a neighbor called the police. The neighbor heard the shot and was concerned. When the police arrived, the homeowner met them and explained what had occurred. The homeowner was then arrested for firing his weapon. Self-defense laws provide the parameters under which the use of a gun may be allowed. The Texas Penal Code states: “A person is justified in using force against another when and to the degree the actor reasonably believes the force is immediately necessary to protect the actor against the other’s use or attempted use of unlawful force.” The Mesquite Police Dept issued a statement in this case. They reported that they did not believe the homeowner should have felt threatened by the burglar’s actions." 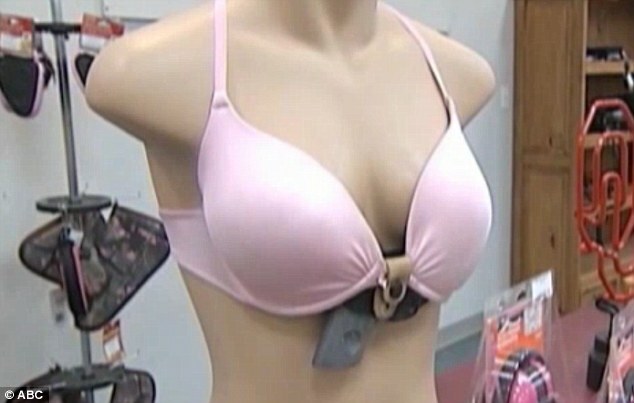 Lingerie for hot shots: The 'Flashbang' bra with a hand gun holster: "A bra fitted with a gun holster is on sale thanks to an ingenious design by a law enforcement supplier from Oklahoma. The Flashbang bra is attached with a thermoplastic shell that is able to store one of more than 20 hand gun styles already on the market. Lisa Looper, owner of Looper Law Enforcement which is a company that produces 'concealed carry gear', came up with the design to give her the ability to defend herself 'at a moment's notice'. It offers a modern-day take on traditional female self-defense systems such as the garter belt holster made popular in American Old Western films of the early Forties. Mrs Looper, a mother of two, told ABC: 'I really never intended to create a holster line, that was never something that I wanted to do. I just did this for myself but as I was talking to other women, they were like "oh my gosh, this is great, I have the same problem.'" Zimmerman back in jail, attorney seeks new hearing: "George Zimmerman's attorney says he expects to file a motion Monday seeking a new bond hearing for Trayvon Martin's shooter, who surrendered to authorities in central Florida after a judge revoked his bond. Wearing a button-down checkered shirt, blue jeans and sneakers, a handcuffed Zimmerman was escorted by two deputy sheriffs from a white minivan into the Seminole County jail Sunday afternoon. He did not answer shouted questions from reporters as he was led inside the jail to be booked, photographed and processed." Court to hear precedent-setting 'castle' case: "In a case that could alter Ohio’s self-defense laws, a Colerain Township man will try Tuesday to overturn his conviction for being in a friend’s car while threatening another man with a gun. Woodrow Edwards III, 29, was in a blue Ford Explorer Sept. 29 in Lockland. That’s when, he testified, he saw a man he didn’t know approach the passenger side door and lift the handle trying to get in. Edwards, who has a valid Ohio permit to carry a concealed gun, was on the phone and became startled. He lifted his .40-caliber handgun partially from the holster on his right hip to get the man’s attention. The man, Eric Taylor, backed off but testified at trial that Edwards pointed the gun at him. Hamilton County Municipal Court Judge Melissa Powers convicted Edwards of aggravated menacing, a crime carrying maximum jail time of 180 days. He didn’t go to jail. 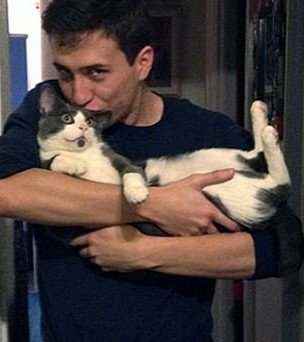 Instead, the judge fined him $100 and ordered him to stay away from Taylor."